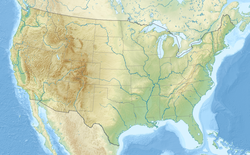 For other places named Plano, see Plano (disambiguation) § Places in the United States. In 1872, the completion of the Houston and Central Texas Railway helped the city to grow, and it was incorporated in 1873. By 1874, the population had grown to more than 500. In 1881, a fire raged through the business district, destroying most of the buildings. The town was rebuilt and business again flourished through the 1880s. Also in 1881, the city assumed responsibility for what would eventually become Plano Independent School District (PISD), ending the days of it being served only by private schools. At first, the population of Plano grew slowly, reaching 1,304 in 1900, and rising to 3,695 in 1960. By 1970, Plano began to feel some of the boom its neighbors had experienced after World War II. A series of public works projects and a change in taxes that removed the farming community from the town helped increase the overall population. In 1970, the population reached 17,872, and by 1980, it had exploded to 72,000. Sewers, schools, and street development kept pace with this massive increase, largely because of Plano's flat topography, grid layout, and planning initiatives. During the 1980s, many large corporations moved their headquarters to the city, including J. C. Penney and Frito-Lay, which encouraged further growth. By 1990, the population reached 128,713, dwarfing the county seat of McKinney. In 1994, the city was recognized as an All-America City. By 2000, the population grew to 222,030, making it one of Dallas' largest suburbs. Plano is surrounded by other municipalities and therefore cannot expand in area, and there is little undeveloped land remaining within the city limits. However, as of July 2012, one large tract of land was being developed: Turnpike Commons at the intersection of Renner Road and the George Bush Turnpike (bordered also by Shiloh Road to the east). The development is expected to feature apartments, medical facilities, restaurants, a Race Trac gas station, and a hotel. There was an epidemic of heroin abuse among young people in the 1990s. The Plano authorities created an anti-drug campaign with the name "Operation Rockfest." In 2013, Plano received top-scoring nationally in a livability index according to an algorithm created by AreaVibes.com, a Toronto-based company specializing in such data. AreaVibes ranked Plano at the top of the list of U.S. cities with populations between 100,000 and 10,000,000. Another chart, "Best Places to Live in 2013", also has Plano ranked number 1. In September 2017, a mass shooting occurred where 9 people were killed. According to the United States Census Bureau, Plano has a total area of 71.6 square miles (185.5 km2). Plano is about 17 miles (27 km) from Downtown Dallas. Plano is in the humid subtropical climate zone. The highest recorded temperature was 118 °F (48 °C) in 1936. On average, the coolest month is January and the warmest is July. The lowest recorded temperature was -7 °F (-22 °C) in 1930. The maximum average precipitation occurs in May. As of 2009 western Plano has a higher concentration of Asians, while eastern Plano has a higher concentration of Hispanics and Latinos. Of the 99,131 households, 35.8% had children under the age of 18. Married couples accounted for 56.7%; 9.7% had a female householder with no husband present, and 29.9% were non-families. Approximately 24.4% of all households were individuals, and 5.3% had someone living alone who was 65 years of age or older. The average household size was 2.61, and the average family size was 3.15. Data indicates that 28.7% of Plano's population was under the age of 18, 7.0% was 18 to 24, 36.5% was 25 to 44, 22.9% was 45 to 64, and 4.9% was 65 years of age or older. The median age was 34 years. For every 100 females, there were 99.3 males. For every 100 females age 18 and over, there were 97.2 males. According to a 2007 estimate, the median income for a household in the city was $84,492, and the median income for a family is $101,616. About 3.0% of families and 4.3% of the population live below the poverty line, including 4.6% of those under age 18 and 7.8% of those age 65 or over. In 2007, Plano had the highest median income of a city with a population exceeding 250,000 in the nation, at $84,492. As of 2010, Plano has a median income of $103,913 annually. According to crime statistics, there were four homicides in Plano in 2006, the lowest homicide rate of all U.S. cities of 250,000 or more population. As of the 2000 U.S. Census, of the foreign-born residents, 17% were from China, 9% from India, and 4% from Vietnam; a total of 30% of foreign-born residents came from these three countries. That year, 22% of Plano's foreign-born originated in Mexico. Plano, along with Houston, has one of the state's two major concentrations of Chinese Americans. The 2010 U.S. Census stated that there were 14,500 ethnic Chinese in Plano. Out of the cities with 250,000 and more residents, Plano has the sixth largest percentage of ethnic Chinese, making up 5.2% of the city's population. Charlie Yue, the executive vice president of the Association of Chinese Professionals, stated that he estimated that about 30,000 Plano residents are Chinese and that many "don't participate in government activities, like the census." Chinese professionals began to settle Plano by 1991. As of 2011 the Chinese restaurants in DFW catering to ethnic Chinese are mainly in Plano and Richardson. Most of the DFW-area Chinese cultural organizations are headquartered in Plano and Richardson. Plano has six Chinese churches and supermarkets including 99 Ranch Market and zTao Marketplace. Approximately 80% of Plano's visitors are business travelers, due to its close proximity to Dallas and the many corporations headquartered in Plano. The city also has a convention center that is owned and operated by the city. Plano has made a concerted effort to draw retail to its downtown area and the Legacy West in an effort to boost sales tax returns. There are three malls in the city: The Shops at Willow Bend, Collin Creek Mall, and The Shops at Legacy, an area that has apartments, shops, and restaurants constructed with the New Urbanism philosophy. An experimental luxury Walmart Supercenter is at Park Boulevard and the Dallas North Tollway. In 2014 Toyota Motor North America announced its U.S. headquarters will move from Torrance, California in the Los Angeles metropolitan area to Plano. In 2015, Liberty Mutual also announced their plans to build a new corporate campus just a few blocks east of Toyota, bringing an estimated 5,000 jobs to the community. In January 2016, JP Morgan Chase and mortgage giant Fannie Mae announced they would be moving regional operations to Plano, bringing a combined 7,000 new jobs to the community. Although Plano is named for the flat plains of the area, large trees abound in the city's many parks. One such tree, estimated to be over 200 years old, resides in Bob Woodruff park near Rowlett Creek on the city's east side. There are two main open space preserves: Arbor Hills Nature Preserve (200 acres) and Oak Point Park and Nature Preserve (800 acres). Bob Woodruff Park and Oak Point Park and Nature Preserve are connected by biking trails, making the green space one large uninterrupted park space that is larger than Central Park in New York City (840 acres). Go Ape, a family-friendly place with outdoor activities like zip lining and Tarzan swings, is at Oak Point Park and Preserve. The yearly Plano Balloon Festival that happens every September is also in Oak Point Park and Preserve. Total acreage of all spaces managed by the Parks department totals 3,830.81. The Plano Master Plan has the acreage growing to 4,092.63 when complete. There are five recreation centers: Tom Muehlenbeck Recreation Center, Carpenter Park Recreation Center, Oak Point Recreation Center, Liberty Recreation Center, and Douglass Community Center. Carpenter Park Recreation Center, Oak Point Recreation Center, and Tom Muehlenbeck Recreation Center have an indoor pool, while Liberty Recreation Center, has an outdoor pool. Plano Senior Recreation Center is a recreation center dedicated to seniors. There are three swimming pools owned by Plano Parks & Recreation: Harry Rowlinson Community Natatorium, Jack Carter Pool, and Plano Aquatic Center. All of the pools are indoor except for Jack Carter Pool. Douglass Community Center houses the Boys & Girls Club of Collin County. For pet owners, there is The Dog Park at Jack Carter Park. The City of Plano also owns and operates three performing arts venues and one conference center under the auspices of the Parks and Recreation Department. These venues include the Courtyard Theater, the Cox Playhouse, the Amphitheater at Oak Point Park, and the Oak Point Park Nature and Retreat Center. A fourth performance venue, McCall Plaza, is under construction in the historic Downtown Plano neighborhood. Plano is governed by the council-manager form of government, with a part-time city council that sets city policy and a city manager who is responsible for city operations. The Plano City Council consists of eight members elected by popular on a nonpartisan basis in staggered odd-year elections every other May. Council members and the mayor are elected by and serve the city at large. However, the council members serving in places one, two, three, and four must reside in that district, and the mayor always serves in place six. The mayor receives a yearly stipend of $8,400, and each council member receives $6,000. All council members, including the mayor, serve a maximum of two consecutive four-year terms. The mayor and city council members could serve for a maximum of three consecutive three-year terms until voters approved changes to the city charter in 2011. The 38th and current Mayor of Plano is businessman Harry LaRosiliere, who was elected as the first African-American mayor of Plano in May 2013. Plano elected its first African-American city council member, David Perry, in 1990. On December 8, 2014, the city council passed an amendment to its civil rights act to include sexual orientation and gender identity as protected. The amendment has not yet taken effect. In the 2008 fiscal year Comprehensive Annual Financial Report, the city reported $194 million in revenue, $212 million in expenditures, $278 million in total assets, $31.4 million in total liabilities, and $337 million in cash and investments. The city of Plano is a voluntary member of the North Central Texas Council of Governments association, the purpose of which is to coordinate individual and collective local governments and facilitate regional solutions, eliminate unnecessary duplication, and enable joint decisions. Plano is part of the North Texas Municipal Water District headquartered in Wylie, Texas. Lake Lavon is the principal source of raw water for the district. Fire and EMS services are provided by the Plano Fire Department. Dallas' wealthy northern suburbs are solidly Republican and Plano, the largest of these suburbs, was ranked as the fifth most conservative city in the United States by the Bay Area Center for Voting Research in 2005. However, the city has become more competitive in statewide elections as its population has diversified, culminating in 2016, when Republican Donald Trump received 49.4% of the city's vote to Democrat Hillary Clinton's 44.4%. Cathie Adams, a long-time conservative activist and past chairwoman of the Republican Party of Texas, is from Plano. In 2014, Plano's City Council passed an expansion of the city's Equal Rights Policy that included anti-discrimination protections for gay, lesbian, and transgender individuals. The ordinance drew the ire of conservative groups such as the Liberty Institute, which argued that the ordinance infringed on the religious rights of business owners. Many civil rights organizations were not supportive either, such as the Human Rights Campaign. The Human Rights Campaign argued that the policy's exclusion of transgender individuals rendered the ordinance not worth defending. Plano is split between the 66th and 67th Districts in the Texas House of Representatives, and is wholly contained in Texas Senate District 8. Republican Matt Shaheen represents Texas House District 66, and Republican Jeff Leach has represented Texas House District 67 since 2013. Republican Angela Paxton represents Texas Senate District 8. Republican Congressman Van Taylor has represented Texas's 3rd congressional district since 2019. Plano is represented in the United States Senate by Republicans Ted Cruz and John Cornyn. The United States Postal Service has several post offices in the area. There are full service offices on 18th St., Jupiter Rd., Coit Rd., Parker Rd., and Hedgcoxe Rd. The Plano Fire Department has 386 full-time firefighters who operate out of 13 stations. The Plano Police Department is an accredited agency and is the principal law enforcement agency serving Plano. The department is led by Chief of Police Gregory W. Rushin. The Plano Police Department has about 600 sworn officers and civilian employees. The department is a member of the North Texas Crime Commission and uses the Crime Stoppers program. In 2010 and 2011, Forbes.com ranked Plano the "Safest City in America" for cities with populations over 250,000. Plano is consistently recognized and awarded by the National Association of Town Watch (National Night Out Awards), the National Sheriff's Association, and the U.S. Department of Justice for "Excellence in Neighborhood Watch". There are 70 public schools, 16 private schools, two campuses of the Collin County Community College District (Collin College), and six libraries in Plano. The Plano Independent School District serves most of the city. Student enrollment has increased dramatically over the past few decades. Plano has a unique high school system, in which grades 9-10 attend a high school and grades 11-12 attend a senior high. There are three senior high schools (grades 11-12) in PISD; Plano East, Plano, and Plano West. In Newsweek's 2012 list of best national high schools, Plano West was ranked as 22nd (#1 in Texas), Plano Senior as 108th, and Plano East as 243rd. Small portions of Plano are served by the Lewisville Independent School District, Frisco Independent School District, and Allen Independent School District. Plano schools graduate more of their students than comparable districts. In 2010, 93% of Plano Independent Student District students graduated from high school, 18 percentage points higher than Dallas ISD's rate. In 2012, Plano Independent School District announced that 128 seniors were selected as National Merit Semifinalists. Plano has given $1.2 billion in property tax revenue to other school districts through the Texas "Robin Hood" law, which requires school districts that are designated as affluent to give a percentage of their property tax revenue to other districts outside of the county. In 2008, PISD gave $86 million. Controversy erupted when the salaries of teachers in less affluent districts—such as Garland ISD—exceeded the salaries of teachers in districts that had to pay into "Robin Hood". In the 2013–14 school year, Plano ISD has opened two 4-year high school Academies, one focusing on STEAM (STEM education plus Media Arts) called Plano ISD Academy High School, and the other on health science. Additionally, the district has modified its existing International Baccalaureate program to allow freshman and sophomores in the program to be housed at Plano East Senior High School. In addition to Catholic primary and middle schools, the Roman Catholic Diocese of Dallas operates John Paul II High School in Plano. Non-Catholic private schools in Plano include Great Lakes Academy, Spring Creek Academy, Yorktown Education, and Prestonwood Christian Academy. In addition, the Collin County campus of Coram Deo Academy is in the One Church (previously Four Corners Church) facility in Plano. Plano is the home to two campuses of Collin College, one at the Courtyard Center on Preston Park Boulevard and the larger Spring Creek Campus on Spring Creek Parkway at Jupiter. SMU-in-Plano, formerly SMU-in-Legacy, a branch of Southern Methodist University, is a graduate university serving the needs of 3,000 working professionals. Its academic programs include business, engineering and computer training, education, and continuing education. It also features The Guildhall at SMU, which offers a masters program in video game development. DBU North, a satellite campus of Dallas Baptist University, is in west Plano, and offers undergraduate and graduate courses and houses the admissions and academic counseling offices. The Plano Public Library System (PPLS) consists of the W.O. Haggard, Jr. Library, the Maribelle M. Davis Library, the Gladys Harrington Library, the Christopher A. Parr Library, the L.E.R. Schimelpfenig Library, and the Municipal Reference Library. The Haggard Library houses the system's administrative offices. Many Chinese parents in Plano enroll their children in supplementary schools, where they get additional mathematics education and/or Chinese language education. Plano is one of 12 suburbs of Dallas that opt into the Dallas Area Rapid Transit (DART) public transportation system. During most of its membership in DART, Plano was lightly served by bus lines, but in 2002, the Red Line of the DART Light Rail project opened stations in Downtown Plano and at Parker Road, which provide access to commuters traveling to work elsewhere in the Dallas area. The Orange Line traverses the same route for selected weekday/peak hour trips. The Cotton Belt Rail Line is also planned to run through Southern Plano. Approximately 1% of the city's population uses DART. The Parker Road station charged for parking for non-member city residents from April 2, 2012 – April 3, 2014 as a part of the Fair Share Parking initiative. Two DART park-and-ride bus facilities, separate from the rail lines, are within Plano: Jack Hatchell Transit Center and Northwest Plano Park & Ride. Plano was the first city in Collin County to adopt a master plan for its road system. The use of multi-lane, divided highways for all major roads allows for higher speed limits, generally 40 mph (64 km/h), but sometimes up to 55 mph (89 km/h) on the northern section of Preston Road. Plano is served directly by several major roadways and freeways. Central Plano is bordered to the east by U.S. Highway 75, the west by Dallas North Tollway, the south by President George Bush Turnpike, and the north by Texas State Highway 121. 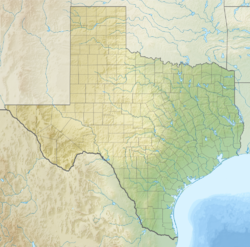 Preston Road (Texas State Highway 289) is a major thoroughfare that runs through the city. Plano is the largest city in Texas without an Interstate Highway. Plano opened a new interchange at Parker Rd. and U.S. 75 in December 2010. The single-point interchange is the first of its kind in Texas. The design is intended to reduce severe congestion at this interchange. According to reports traffic congestion has been reduced 50-75%. Plano is roughly 30 miles northeast of Dallas/Fort Worth International Airport; it is the primary airport serving Plano residents and visitors. Kenton Duty, actor; played Gunther Hessenheffer on Disney Channel original series Shake It Up! C. H. Greenblatt, creator of the TV animated series Chowder (TV series); writer for the TV animated show SpongeBob SquarePants. Brad Hawkins, actor who starred on VR Troopers; country singer and martial artist. Florence Shapiro, Republican member of Texas Senate, known for sponsoring "Ashley's Laws"
Plano has six sister cities designated by Sister Cities International. This program's presence is seen in Plano ISD schools, where representatives from sister cities often meet and tour. ^ Hageland, Kevin (January 8, 2009). "Anatomy of a top 10 list". Plano Star Courier. Plano, Texas: Star Local News. Retrieved July 11, 2011. ^ "2010 United States Census". 2010 United States Census. 2010. Archived from the original on March 2, 2011. Retrieved July 11, 2011. ^ Greenfield, Beth. "#1 Plano, Texas". Forbes.com. p. 1. Retrieved April 12, 2018. ^ a b c d e f g h i "Plano Timeline" (PDF). Plano, Texas: City of Plano. February 17, 2011. Retrieved July 11, 2011. ^ a b c d Schell, Shirley; Wells, Frances B. "Plano, TX". Handbook of Texas Online. Texas State Historical Association. Retrieved July 11, 2011. ^ "All-America Cities by State (1949–2009)" (PDF). All-America City Award. Retrieved July 11, 2011. ^ Goad, Kimberly. "The Shooter." D Magazine. December 1999. Retrieved on June 11, 2016. ^ Heid, Jason. "How Plano Kicked Its Heroin Habit, How Dallas' Thomas Jefferson High School Is Kicking Its Own." D Magazine. January 31, 2012. Retrieved on June 11, 2016. ^ "Best Places To Live In The US - Top Cities In America 2019". www.areavibes.com. Retrieved February 24, 2019. ^ "Top 10 Cities - Best Places To Live 2013". Areavibes.com. Retrieved September 12, 2017. ^ "Friends Remember Victims Of Plano Mass Shooting: 'Full Of Love'". Retrieved September 12, 2017. ^ Haag, Matthew. "Maybe Toyota moved to Plano because the suburb is a lot like Torrance, Calif." (Archive). The Dallas Morning News. May 6, 2014. Retrieved on September 4, 2015. ^ "Plano (city), Texas". State & County QuickFacts. U.S. Census Bureau. Archived from the original on October 23, 2013. Retrieved December 5, 2013. ^ a b Brettell, Caroline B. '"Big D" Incorporating New Immigrants in a Sunbelt Suburban Metropolis' (Chapter 3). In: Singer, Audrey, Susan Wiley Hardwick, and Caroline Brettell. Twenty-First Century Gateways: Immigrant Incorporation in Suburban America (James A. Johnson metro series). Brookings Institution Press, 2009. ISBN 0815779283, 9780815779285. Start p. 53. CITED: p.61. ^ "Plano 2007 Income Estimates". 2007. Retrieved July 11, 2011. ^ "NBC5i.com". Retrieved July 11, 2011. ^ "Offenses Known to Law Enforcement by State by City, 2006". Uniform Crime Report, 2006. FBI. 2007. Archived from the original on December 22, 2010. Retrieved July 11, 2011. ^ Brettell, Caroline B. '"Big D" Incorporating New Immigrants in a Sunbelt Suburban Metropolis' (Chapter 3). In: Singer, Audrey, Susan Wiley Hardwick, and Caroline Brettell. Twenty-First Century Gateways: Immigrant Incorporation in Suburban America (James A. Johnson metro series). Brookings Institution Press, 2009. ISBN 0815779283, 9780815779285. Start p. 53. CITED: p.64. ^ a b c Kripke, Pamela Gwyn. "Why 30,000 Chinese People Call Plano Home" (Archive). D Magazine. June 2012. Retrieved on September 27, 2014. ^ Meyers, Jessica. "Rare Chinese bilingual program highlights Plano schools' diversity" (Archive). The Dallas Morning News. November 4, 2011. Retrieved on September 22, 2014. ^ Brenner, Leslie. "Best in DFW: Chinese restaurants" (Archive). The Dallas Morning News. March 9, 2011. Updated February 10, 2013. Retrieved on September 22, 2014. ^ Connie Dufner. "Asian supermarket bonanza: 7 great places to shop in North Texas". Retrieved May 31, 2018. ^ "Upscale mall Shops at Willow Bend opens today in Plano to offer array of stores new to Texas". The Fort Worth Star-Telegram. August 3, 2001. Retrieved January 8, 2013. ^ "Leading Employers | Plano Economic Development, TX - Official Website". www.planotexas.org. Retrieved February 24, 2019. ^ "Legacy Town Center". Plano, Texas: Legacy In Plano. Retrieved July 11, 2011. ^ Bivins, Ralph (February 13, 2000). "The Woodlands becomes a leader in office construction". Houston Chronicle. pp. Business 8. Retrieved July 11, 2011. ^ "Headquarters Regional Offices". Retrieved May 3, 2018. ^ "Huawei Device USA, Inc. HQ". Huawei.com. ^ "Software & Services for the Public Sector - Tyler Technologies". Tylertech.com. Retrieved February 16, 2019. ^ Hirsch, Jerry and David Undercoffler. "Toyota to move jobs and marketing headquarters from Torrance to Texas." Los Angeles Times. April 27, 2014. Retrieved on April 29, 2014. ^ "Liberty Mutual to bring up to 5,000 workers to Plano". Dallas News. April 7, 2015. Retrieved February 16, 2019. 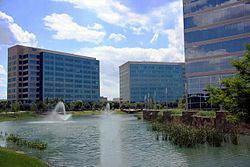 ^ "JPMorgan Chase picks Plano's Legacy West for new 6,000-employee campus". Bizbeatblog.dallasnews.com. Retrieved September 11, 2017. ^ "Plano's map of big trees". Tx-plano2.civicplus.com. Retrieved August 24, 2014. ^ "Plano's Bi-centennial Bur Oak". Tx-plano2.civicplus.com. Retrieved September 11, 2017. ^ "Plano, TX". Goape.com. Retrieved September 11, 2017. ^ "Plano Park Master Plan". Plano.gov. Retrieved August 24, 2014. ^ "Plano, TX - Official Website". Plano.gov. Retrieved September 11, 2017. ^ "Plano Stages - City of Plano". planostages.com. City of Plano. Retrieved March 13, 2015. ^ "City Council". Plano, Texas: City of Plano. 2013. Retrieved January 5, 2014. ^ Boardman, Ananada (2013). "Plano, McKinney to vote on change to city council terms". Dallas Morning News. Retrieved January 5, 2014. ^ Schnyder, Mark (2013). "Plano Elects First Black Mayor". Nbcdfw.com. Retrieved January 5, 2014. ^ Watkins, Matthew (2013). "David Perry, Plano's first black city council member, has died". Dallas Morning News. Retrieved January 5, 2014. ^ Hundley, Wendy (December 9, 2014). "Plano approves controversial Equal Rights Policy". Dallas Morning News. Retrieved December 9, 2014. ^ "City of Plano CAFR" (PDF). Plano, Texas: City of Plano. 2008. Retrieved July 11, 2011. ^ Bay Area Center for Voting Research Retrieved January 7, 2014. ^ "November 8, 2016 Combined Election Day and Early Ballots - Statement of Votes Cast." Collin County Election Result Archive. Retrieved on October 24, 2018. ^ "Joint / General Election - November 8, 2016: Official Results." Denton County, TX Elections. Retrieved on October 24, 2018. ^ Ford, Zack. "Plano, Texas Passes LGBT Nondiscrimination Protections Despite Vocal Opposition". ^ "Opponents of Plano's LGBT policy say petition drive successful". Thescoopblog.dallasnews.com. ^ "HRC Unlikely to Defend Plano Nondiscrimination Ordinance". Retrieved April 7, 2015. ^ "TCFP Regulated Departments by Size". Texas Commission on Fire Protection. Retrieved November 13, 2015. ^ "Plano CALEA Accreditation". Yudu.com. p. 20. Retrieved November 24, 2014. ^ a b "Meet the Chief of Police". The City of Plano. Retrieved November 24, 2014. ^ "America's Safest Cities". Forbes.com. October 11, 2010. Retrieved November 24, 2014. ^ "National Night Out Awards: 2013 Award Winners". National Association of Town Watch. Retrieved November 24, 2014. ^ a b "Secondary schools". Plano, Texas. Retrieved July 11, 2011. ^ "America's Best High Schools 2012". Newsweek. Retrieved June 11, 2012. ^ "6 Reasons Why Everyone is Moving to Plano". SpareFoot. November 13, 2014. Retrieved January 19, 2015. ^ "128 Seniors Named Semifinalists in National Merit Program". Plano ISD. Archived from the original on October 29, 2012. Retrieved November 1, 2012. ^ "Budget FAQ". Plano, Texas. 2008. Retrieved July 11, 2011. ^ Plano ISD mutes criticism of 'Robin Hood' as its annual funding hit declines | The Dallas Morning News. Dallasnews.com. Retrieved on July 17, 2013. ^ "Academy Programs of Plano". Plano ISD. Retrieved November 1, 2012. ^ "Collin County Campus Archived October 24, 2011, at the Wayback Machine." Coram Deo Academy. Retrieved on October 12, 2011. "Located at One Church- 2400 State Highway 121, Plano, TX"
^ "Campuses". Plano, Texas. Retrieved July 11, 2011. ^ "SMU Plano". Plano, Texas. Retrieved July 11, 2011. ^ "Guild hall/". Retrieved July 11, 2011. ^ "DBU North | Dallas Baptist University". www.dbu.edu. Retrieved September 26, 2015. ^ "General Information." Plano Public Library System. Retrieved on October 17, 2011. "W.O. Haggard, Jr. Library 2501 Coit Road (75075)" and "Library Administration 2501 Coit Road"
^ "Former Plano resident, 7-time Tour de France winner Lance Armstrong retires". Dallas Morning News. Dallas, Texas: Dallas Morning News. February 16, 2011. Retrieved July 11, 2011. ^ "Justin Blalock". 2014 NFL Enterprises LLC. Retrieved June 18, 2014. ^ "Spencer Boldman". Dallas Morning News. Retrieved June 18, 2014. ^ "UCLA Athletics". UCLABruins.com. Retrieved September 11, 2017. ^ Mayo, Michael (March 9, 1994). "Injury Puts Couples Out Of Honda". Sun-Sentinel. Retrieved June 18, 2014. ^ "Chace Crawford busted for pot possession". Reuters. June 4, 2010. Retrieved July 11, 2011. ^ "Kenton Duty". City-data.com. Retrieved June 19, 2014. ^ "Bob Guccione". 2014, The Dallas Morning News Inc. Retrieved June 19, 2014. ^ "Jimmy King". 2002-2011 databaseSports.com. Archived from the original on July 22, 2014. Retrieved June 19, 2014. ^ "John Leake". 2000-2014 Sports Reference LLC. Retrieved June 19, 2014. ^ "Nastia Liukin". Encyclopædia Britannica. Retrieved June 19, 2014. ^ "Kevin McHale". 2014 CBS Interactive Inc. Retrieved June 19, 2014. ^ "Hunter Parrish". 2011 USA TODAY, a division of Gannett Co. Inc. Retrieved June 19, 2014. ^ "Charlie Peprah". 2014 ESPN Internet Ventures. Retrieved June 19, 2014. ^ "Boz Scaggs". ClassicBands.com. 2011. Retrieved July 11, 2011. ^ Fong-Torres, Ben (2011). "Boz Scaggs: The Lowdown". Bozscaggs.org. Retrieved July 11, 2011. ^ "Spurred by success: Meenakshi bares her claws!". Stardust. October 31, 2013. Retrieved May 19, 2014. ^ "Florence Shapiro". SMU. Retrieved June 18, 2014. ^ Thurber, Jon (November 13, 2000). "L. Sprague de Camp; Prolific Sci-Fi Writer". Los Angeles Times. Retrieved June 18, 2014. ^ "Biographical Profile for Matt Shaheen". Vote-tx.org. Retrieved December 6, 2014. ^ Hathorn, Billy (2010). "Mayor Ernest Angelo, Jr., of Midland and the 96-0 Reagan Sweep of Texas, May 1, 1976". West Texas Historical Association Yearbook. 86: 81–2. ^ "Little-Known Actor Mulls Three High-Profile Film Offers (Exclusive)". The Hollywood Reporter. Retrieved May 9, 2018. ^ "Alan Tudyk". Dallas Morning News. Retrieved June 19, 2014. ^ "Michael Urie". New York Observer. Retrieved June 19, 2014. ^ "Interactive City Directory: City of Ivanovo, Russia". Sister-cities.org. Retrieved February 15, 2015. ^ a b c "International Affairs". Plano.gov. Archived from the original on August 24, 2011. Retrieved July 11, 2011. ^ "Municipal Cooperation, 1967-Present" (PDF). Brampton.ca. Retrieved February 15, 2015. ^ "Hsinchu celebrates ties with its Texas sister city". Taipei Times. September 24, 2003. Retrieved July 11, 2011. ^ "Interactive City Directory: Adelaide-Enfield, Australia". Sister-cities.org. Retrieved February 15, 2015. This page was last edited on 10 April 2019, at 03:11 (UTC).